Knowing when you should water your garden is vital and can mean the difference between a productive plant and plant that easily falls victim to disease and pests. Following a few guidelines ensures your watering efforts are appropriate and successful. You should water your garden either early morning or early evening. Both times allow the moisture to penetrate the soil without excessive evaporation. The general guidelines for watering gardens can help you adjust your gardening habits. Consistent watering is best although you should adjust your schedule during long periods of rain to void over watering plants. Use a rain gauge to track how much rain your garden receives and adjust amounts accordingly. Check the soil one hour after watering. If the top four to six inches of soil are still moist, you've done a good job. Soak the soil around the plant. Water on plant leaves during the day can scorch the leaves. Water on leaves at night can set up a home for fungus. Burpee advises if your garden only receives a half-inch of rain, water it immediately, so the amount is brought up to one inch. The long-standing gardening rule that a garden requires one inch of water per week isn't necessarily true. The Old Farmer's Almanac advises this rule doesn't take soil types into consideration. Clay soils retain more moisture than sandy soils. It easy to over water a clay-based garden soil by following the one-inch rule. Mulch helps the soil retain moisture and protects the plant roots from extreme heat (or cold). Add four to six inches of mulch around garden plants for optimum benefits. Weather changes can increase or decrease the amount of water needed for a healthy garden. A long period of high temperatures can harm and weaken older plants, so you may need to water them. Older established plants usually have deep roots and can survive a short dry spell but will need watering during a prolonged drought. A period of continuous rain can harm gardens by saturating the soil, so the plant roots can't take in oxygen. Plants can die from oxygen deprivation. Plant roots grow toward water, and deep watering means deep soil moisture. This allows plants to develop a deep root system to sustain plants during dry spells. Shallow watering promotes shallow root systems and weakens plants. 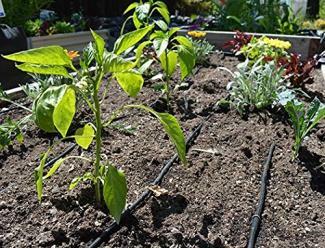 Many gardeners prefer soaker hoses or irrigation systems, such as drip lines that deliver water directly to the roots. Cover soaker hoses or drip lines with mulch for a double moisture impact. Too much water can damage the roots and even cause root rot. Over watering dilutes valuable soil nutrients. Too little water makes the plant weak with shallow root systems. Inconsistent watering weakens plants and makes them vulnerable to diseases and pests. Gilmour advises watering flower gardens between 6 am and 10 am when the temperature is cooler and there's less evaporation. When planting seeds, keeping the soil moist to boost germination process. Fill the hole for transplant with water prior to setting the plant. New transplants or seedlings require a daily soaking for the first week, then every two days with deep soakings. Add a layer of compost four to six inches thick around the plant to help retain moisture. Worried you've over watered? Check the top three inches of soil. If moist or wet, hold off until soil has dried out a little. Early morning and early evening are the best times to water a vegetable garden. The one-inch rule is often applied to vegetable gardens. Always check the first three inches of soil to determine if the garden needs more water. If the soil is moist, skip it until the next scheduled time. Over watering can kill plants through saturation and depriving roots of oxygen. Due to evaporation, vegetable gardens in very hot and humid regions may require more frequent watering than those in milder climates. Always water the soil, never the plants, especially leaves. Vegetable garden plants that need frequent watering include lettuce, cabbage, broccoli, cauliflower, asparagus, and celery. Known as the Mediterranean herbs, rosemary, oregano, sage, lavender, and thyme are native plants to the Mediterranean Basin, and are drought tolerant. Water Mediterranean herbs only when the soil becomes dry. Most herbs, such as lemon balm and peppermint, should be watered whenever the soil becomes dry. Basil, cilantro, and parsley may require more frequent soakings during extremely hot weather since both herbs prefer moist soil. 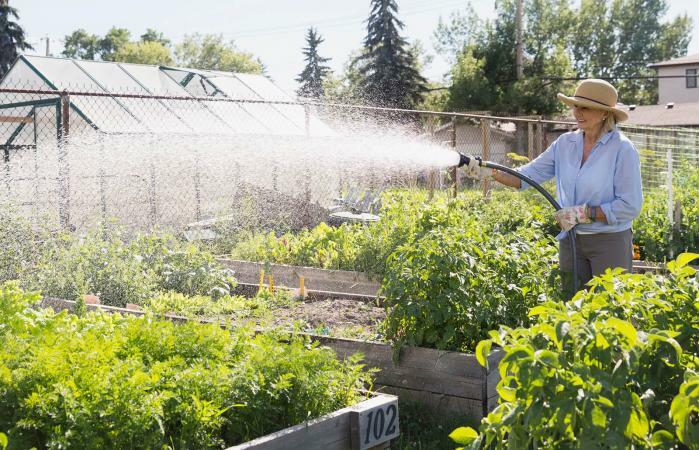 Following a few gardening rules will help you know when it's best to water your garden. Learn the watering needs for each plant in your garden to ensure you provide the right amount needed.